Valentine Cupcakes with a surprise middle! So I started out by cooking a box of strawberry cake mix in a regular square cake pan. 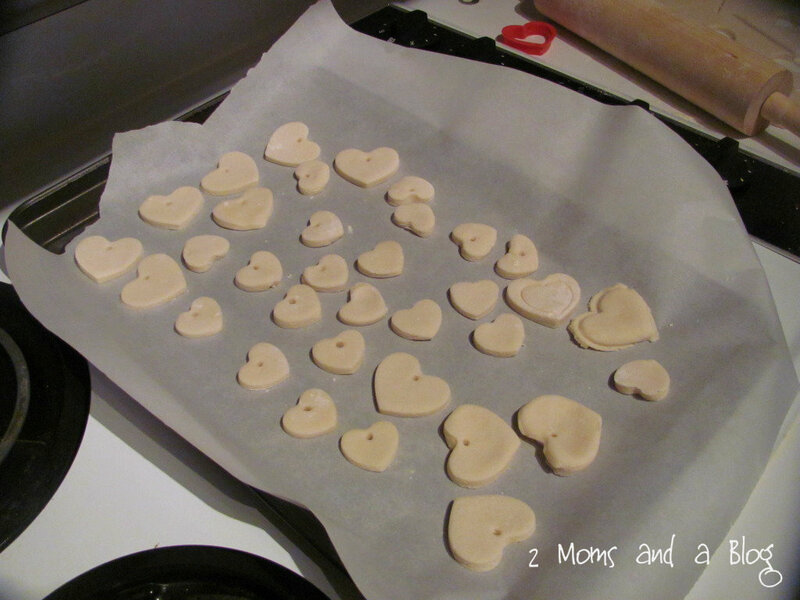 Allowed it to cool and then using a small cookie cutter, cut out some hearts. 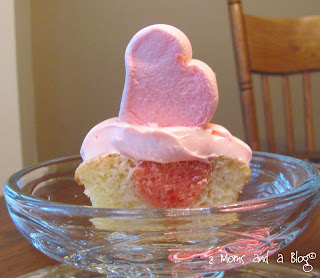 Now depending on how much your cake rose, you may need to cut these little hearts in half and make 2 out of one cut. Next I prepared a batch of vanilla cake mix. I put some cupcake liners in my cupcake pan and dolloped a little bit of the vanilla cake mix in the middle of each liner. Then I took one of my strawberry hearts and placed it in the batter. Then I carefully spooned more of the vanilla batter over the top and around the sides. You want to be sure that the batter doesn't knock your heart over or out of place. As you are placing in the hearts make sure they are all turned in the same direction. You will need to mark the batter in some way in the direction the heart is, so when people bite in the heart is facing them. 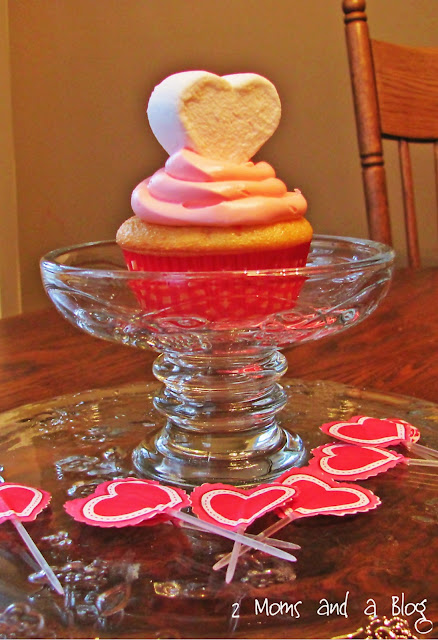 I used a little red food coloring and dipped a toothpick in and put a dot facing the direction of the hearts. I thought I would add that this was supposed to be a trail run and I was going to make a better version of this to post this week. 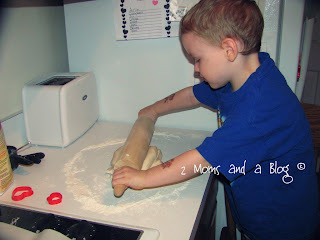 But my son has come down with the horrible sickies and I don't think I'll be doing anymore baking this week. I should have pushed the hearts down more into the batter and covered them better. You'll see why in a moment. Now bake according to the box directions. In the mean time get your frosting prepared. I used cream cheese and tinted it with red food coloring. 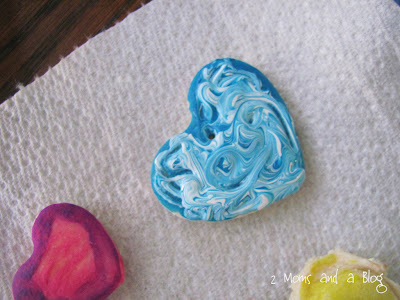 I don't have any of those fancy pastry bags, ziplock has been my friend when decorating cakes, cookies and cupcakes. One of the best tricks I've learned when putting frosting into a ziplock bag is to but the bag into a small cup then put the batter in. So much easier! Then just cut a little corner off the bottom for your frosting to come out of. When your cupcakes are done cooking let them cool completely. Now before frosting, make sure you place the cupcake in front of you with the little red dot facing you. Now frost away, and please be more creative than I was! I topped with a heart marshmallow facing in the direction the red dot was so people knew to bite into the cupcake that way. Now cut open to find the heart inside. And getting back to my note on needing to push the heart down better before baking, as you can see the very top of my heart was not showing well on this one. It came out good in some of the cupcakes, but I didn't want to cut open them all open at the same time. 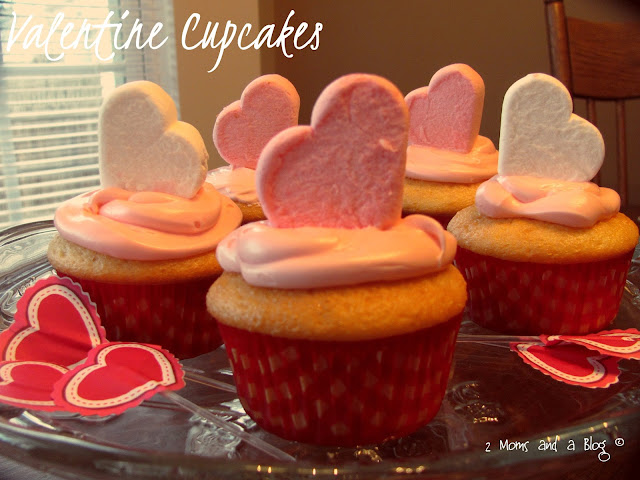 This is great way to get different shapes inside a cupcake. If there is a cookie cutter small enough, it should work! Also a good idea for all those gender reveal cupcakes going around lately! 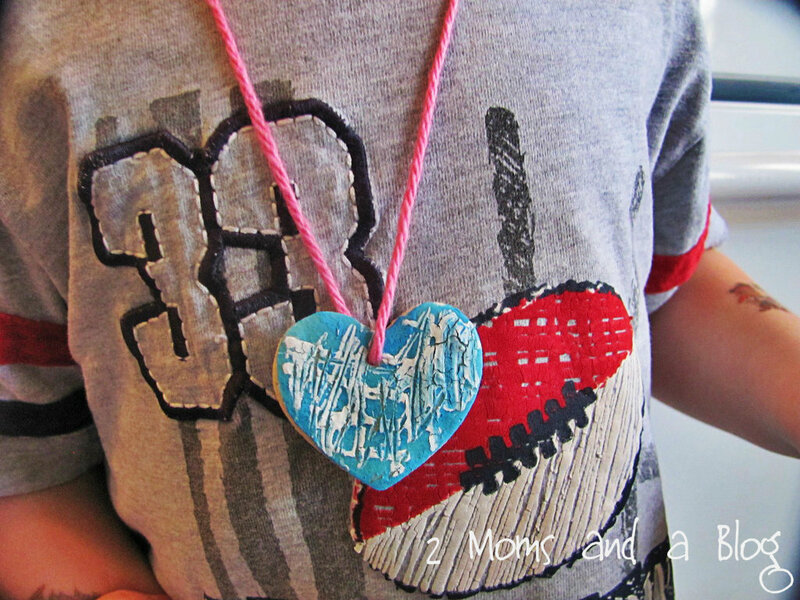 DIY Valentine Heart Craft for kids! So simple! I got the inspiration for this versatile Valentine craft from Pinterest, in particular this post. What I loved about this idea is that it's easy for kids to do, and add their own style to each little heart. 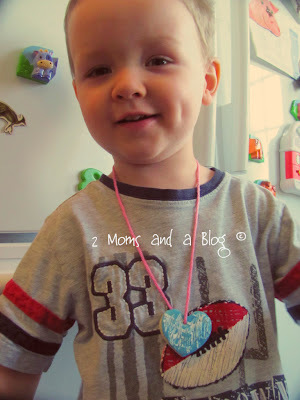 The end result can be a necklace, magnet, paper weight... whatever! After making the dough let the kids help roll it out very thin then use cookie cutters to cut out your hearts. If you want to make necklaces or something you can hang with ribbon make sure to poke a hole in the top of the heart. I used a wooden skewer. This part is fun for the kids! 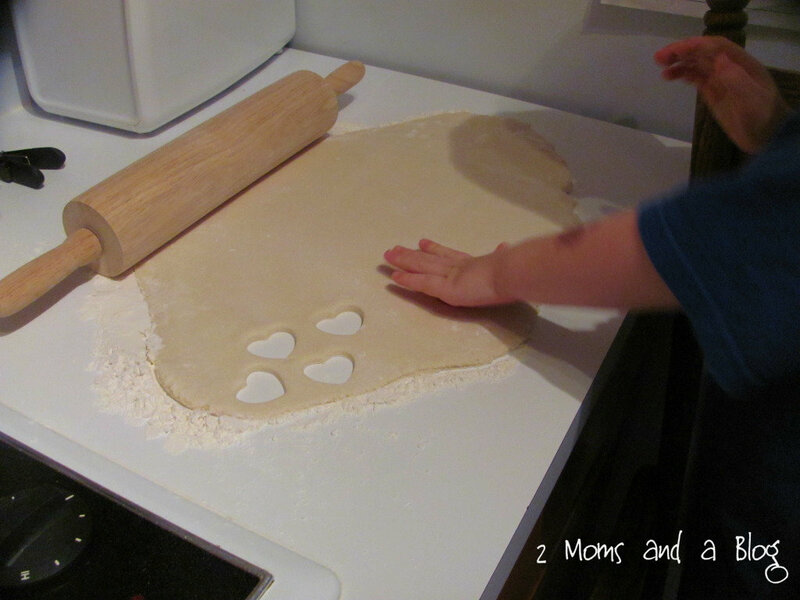 Line your baking sheet with some parchment paper and bake at 300 degrees for about 40 minutes. You'll know they are ready when they are hard and beginning to brown a tiny bit on the top. Pull out of the oven and let cool. Then let your kids paint them however they want. 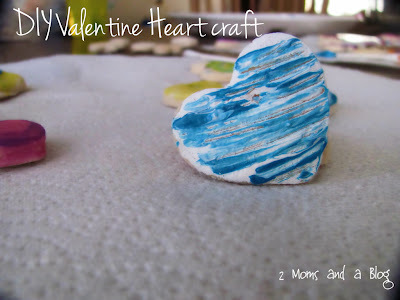 One batch makes a lot of hearts, so this would be great for something your kids could hand out to their friends or family.